Sorry for the delay in posting this week, readers. I’ve unfortunately caught whatever virus is going around, despite my best efforts to avoid it. I’m on the mend, though, drinking lots of fluids, and making my comeback! I hope everyone’s week is off to a good start…though seeing how it’s actually mid-week, I guess I should be saying, I hope the week is going well thus far! 1) I’ve been working on taking some more “fashion risks” lately but styling monochromatic looks, while also styling seeming “random colors” together. It’s funny how being a blogger pushes you out of your comfort zone, but I personally think it really does! If you’re in the market for taking some fashion risks of your own, monochromatic looks are very easy to use as a starting point. If want to try putting random colors together, you can try working within color families. In this look, I stuck with jewel toned colors to create harmony within different colors and patterns worn together. 2) I’m still working on incorporating silk scarves into my fashion repertoire. It’s actually a lot easier than I thought it would be! Though, I’ve found that silk scarves from standard retail shops are quite pricey ($50+), whereas they seem to be much more affordable via consignment and thrift shops ($3+). 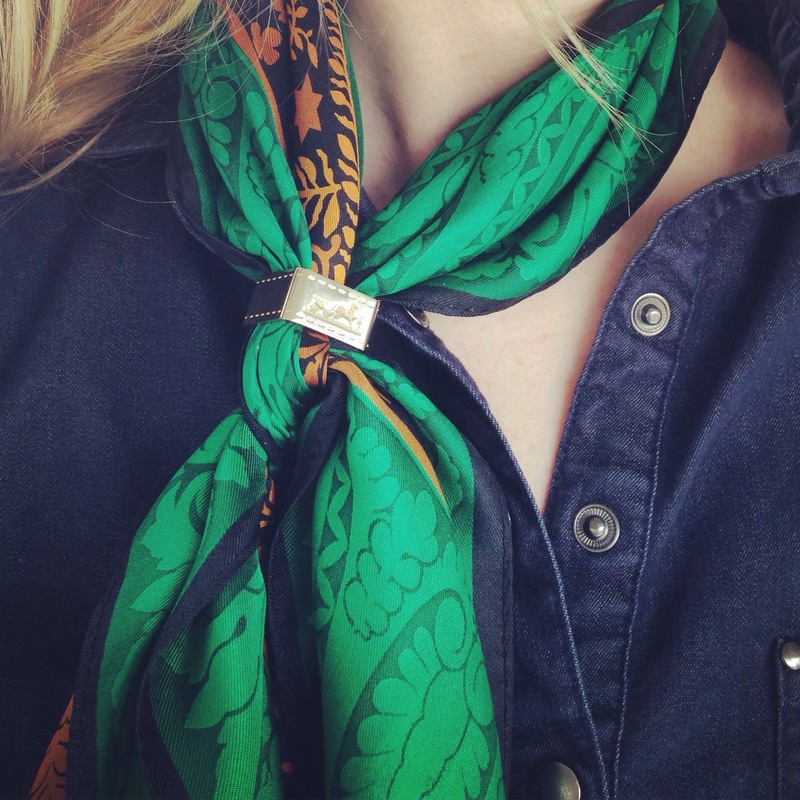 For more scarf inspiration, check out Pinterest, where you will find a ton of silk scarf ideas! One of my favorite boards can be found here. Anyone else pairing different colors together? Any color pairing recommendations? Thanks so much for stopping by, readers! I appreciate it so very much! Hope you are better now… am liking your styling the scarves with outfits, a pretty change must say. Love the bellies color..sooo gorgeous. oh no!! I’ll check them now :)~!! That’s happened to me before- sometimes that reader is a little unreliable! 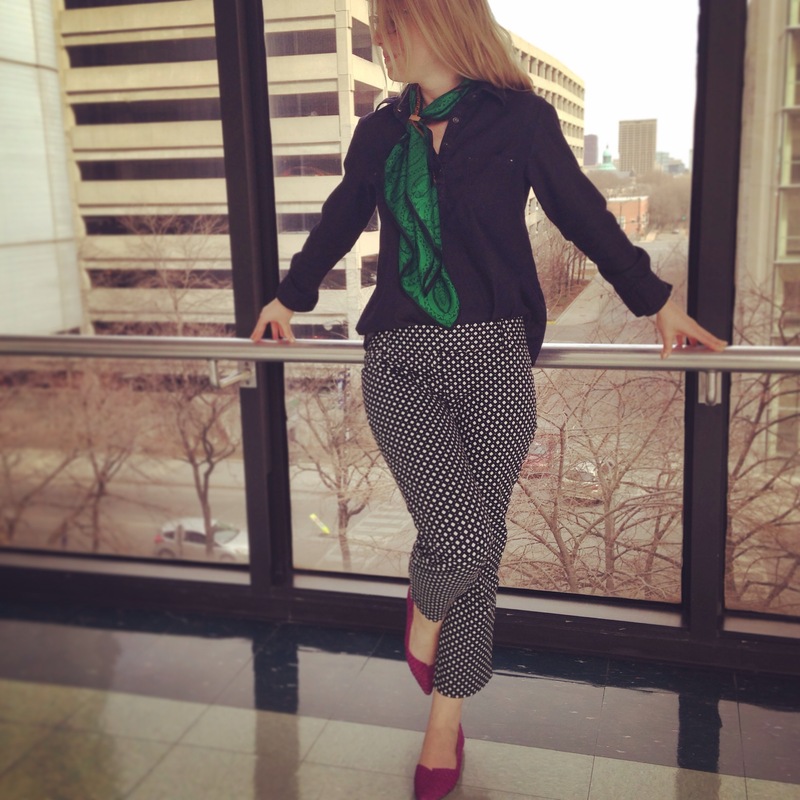 love love the pants and the shoes…swoon, Im having a polka dot obsession lately. Get well soon and fabulous look!!! Love that kelly green..it really makes a difference to the overall outfit. I’ve never thought to look at thrift shops for scarves. Thanks for the idea! hello there cute shoes!! love the scarf too! Can’t wait to see how you style them 🙂 I’m still working on it too!! Thank you sooooo much~!! I appreciate it and your support so very much! I hope you get better soon! I think I am on the brinks of getting sick my co-workers have the same bug and I don’t think I can fight the sickness off any longer. Beautiful incorporation of colors into this outfit. I need to try adding silk scarfs into my look and see what I come up with. Off the charts! Love the photos girl so editorial! have a great day. I hope you feel better now ! The look today is gorgeous , the scarf and shoes are so awesome ! Looking fabulous as always! I have said this before but must repeat .. I truly admire your take on color-blocking .. its always executed in such an effortless manner. As for this particular outfit; your trousers are my favorite! I hope you feel better now ;). Are these polka pants? Love,love.love them! Also, great colour combination with those bright pink shoes and emerald scarf! Love your style! Yes! 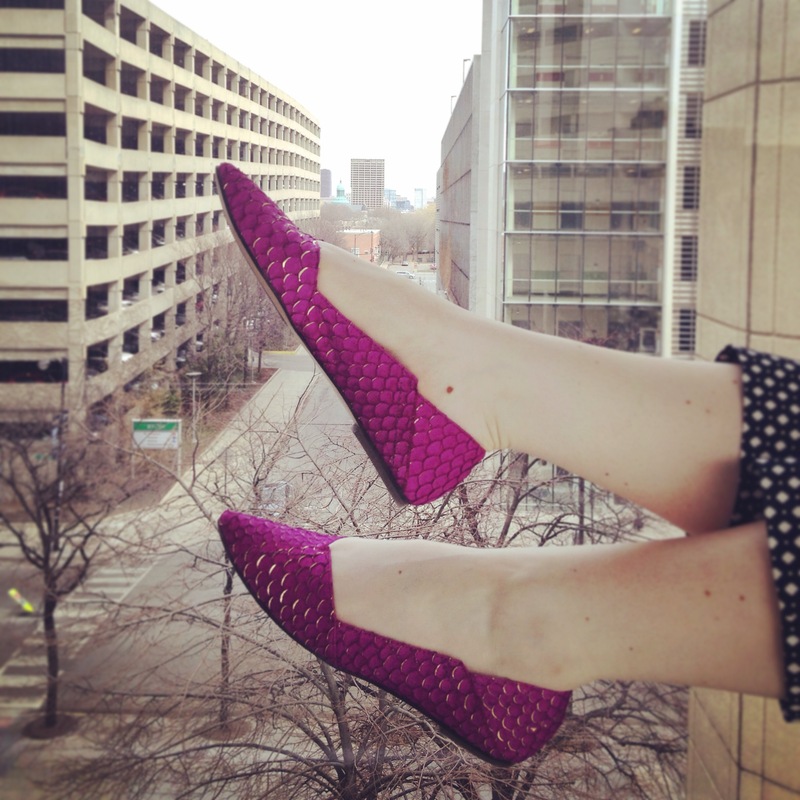 They are a polka dot sort of squared off print :)~! oh my, these shoes! super wow! I am more uni colored -black, but i would definitely add those shoes! I love that scarf! The green is very striking. Thanks for the well wishes, readers!! hugs! Always like the places you find to pose and your daring approach to modelling.